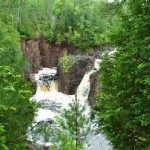 Copper Falls State Park features three scenic waterfalls on the Tyler Forks and Bad rivers. The park’s natural attractions also include canyons, deep gorges, streams, and a swimming beach. Visitors will enjoy the picnic area with a log shelter, miles of self-guided nature trails, and family campground. In addition, walk-in and backpack campsites are available. Log buildings built by the Civilian Conservation Corps in the 1930s add to the park’s charm. There is plenty to do, including hiking, bicycling, picnicking, fishing and swimming. In the winter, skiing and snowshoeing are popular activities on the trails. The park has four classic-only loops, beginner-intermediate, totaling 11.4 km. Copper Falls also boasts two skate/classic combination loops totaling 10.5 km. All of the park’s trails are generally well-groomed and maintained. The North Country National Scenic Trail also passes through Copper Falls State Park. Located about 2 miles northeast of the city of Mellen, Copper Falls itself is a 40-foot waterfall which marks the first drop of the Bad River as it flows through steep-walled gorges of rugged and awesome splendor. A 500-acre area around the falls has been designated as a State Natural Area. 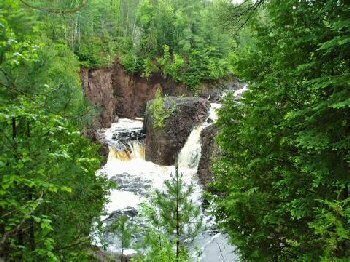 The park also encompasses Red Granite Falls on the Bad River and the 30-foot Brownstone Falls cascading down the Tyler Forks River. Copper Falls State Park’s concession stand is open daily from Memorial Day weekend through Labor Day weekend, and on weekends through mid-October. The concession stand offers a small gift shop along with soft drinks, light lunches, ice cream, and ice. Sunday mornings are especially popular at the concession as a pancake breakfast is held. Winter, spring, summer and fall – Ashland County is a year-round vacation destination for nature enthusiasts and silent sports fans. No matter the season, Ashland County cordially welcomes visitors to enjoy and explore this shining jewel crowning the greatest of the Great Lakes. Here are some waterfalls in the area. Click here to download a brochure on waterfalls within 60 miles of Ashland.